..... with the strategy providing not only tax savings but the gratification of seeing beneficiaries receive benefits. One area of significant focus for ageing SMSF trustees is their estate planning. It is now becoming better understood that superannuation does not automatically form part of a deceased person’s estate and, as such, superannuation, and in particular SMSFs, have become one of the most discussed vehicles for estate planning control and taxation minimisation. It goes without saying that careful planning is required by a SMSF trustee to not only decide who their desired beneficiary or beneficiaries are going to be, but in what form payment of this benefit will be received. The good news is that there are many tools available to ensure that in the event of death, a benefit is received by the desired beneficiary/ies. These tools include binding death benefit nominations, reversionary pensions and customised trust deeds. The discussion around estate planning with SMSF trustees involves what happens with the member’s benefit after death. However, what is becoming increasingly common, particularly with older trustees, is a discussion around the payment of benefits before death. A popular strategy being implemented by older SMSF trustees is to partially cash out their member benefits, ensuring to leave a sufficient amount for their own benefit (and their spouse if applicable) and gifting funds to their inevitable beneficiaries, often their children. The benefit of this strategy predominantly revolves around the tax saving of a payment paid to a potential non tax dependent, but the instant gratification of assisting a beneficiary/ies and seeing the difference this makes is often the key driver of this strategy. Bill and Theresa have set up their Account Based Pensions (ABP) as reversionary to each other and it is their intention that on both their deaths that their member benefits is paid to their Legal Personal Representative (LPR) and split through their Estate: 50 per cent each to David and Debbie. Bill and Theresa are extremely keen to understand what tax would be payable on their passing. It is explained to the, that their member benefit paid to each other on death will be tax free as they are taxation dependents as per table 1 below. However, it is also explained that payment of a superannuation death benefit can attract tax when paid to a non-tax dependant. As can be seen in table 2 below, when super is passed to this type of beneficiary, the taxable component will be subject to tax while the tax-free portion will be received tax-free regardless of which beneficiary it’s paid to. Bill and Theresa now understand that the taxable component of their SMSF when eventually passed to a non-tax dependant (ie, their adult children) will be subject to tax based on their current combined taxable component of $1,000,000 and this tax of $150,000 will be less that their children would receive. While Bill and Theresa have their SMSF estate planning well organised, they are of the feeling that they would like to financially help David and Debbie, with their primary motive to ensure that they are both well set up. Both David and Debbie are coping reasonably well financially. On a day-to-day basis they have managed with paying education costs for their own children and have paid off their mortgages; however, they have not started to save for retirement and Bill and Theresa fear they will not have enough to retire at a reasonable age. After extensive discussions, Bill and Theresa decide that they wish to gift both David and Debbie $500,000 each. Fortunately, they take the correct measures to make the withdrawal from the ABPs with the 100 per cent taxable component and they are extremely pleased that they will be saving tax of $150,000 on their current member values. Bill and Theresa also decide they don’t want the money being gifted to David and Debbie to be immediately accessible. During their extensive family discussions Bill and Theresa inform David and Debbie they want the funds they are gifting to be contributed into superannuation as a non-concessional contribution. Bill and Theresa are comfortable with this concept understanding the significant difference this will make to their future retirement plans. One concern for Bill and Theresa is that David and Debbie both have superannuation with smaller account balances in a retail super fund for which they have no general awareness of how their superannuation is invested or how it has been performing. During the discussions, the concept of David and Debbie becoming members of the SMSF is discussed and as a group they decide that this is a viable strategy. As a group they believe they can make cohesive and collaborative investment decisions with their portfolio and David and Debbie are particularly keen to take a more hands-on approach with their superannuation. Bill and Theresa also like the concept of feeling like they have some control over the funds gifted to David and Debbie. They are also conscious as they are getting older there is potentially a point in time when they become incapable of running their own retirement savings and they are mindful that having their children as members of the fund (and with a correct power of attorney in place) allows the fund to continue to be managed. They also like the fact that their SMSF has the ability to continue well beyond their death with the children being able to have the discretion as the continuity of the structure going forward. Of course, this strategy is not without risk, including divorce for the children and family law court implications, age care gifting provisions and the potential out-of-market timing of having to sell investments for gifting and re-contribution back into the SMSF. 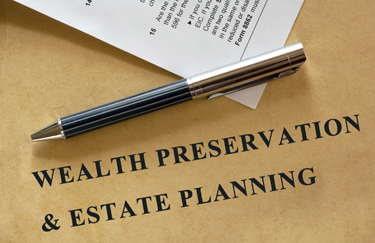 Overall, Bill and Theresa are extremely pleased with the estate planning of their SMSF, not all of which now revolves around what happens on their death. They have been able to eliminate tax paid on the eventuality of their super being paid to their children and they have also been able to financially help their children while continuing to exert some control over the gifted funds.